The Round Lake Area Exchange Club and sponsor, Consumers Credit Union, are proud to announce U.S. Army Private Second Class, Anthony J. Downes as the October hometown hero. He is a 2013 graduate of Grayslake North High School and is currently stationed at Fort Leonard Wood in Missouri. He was registered for this honor by his parents, Debra and Richard Downes of Grayslake. Downes is no stranger to serving his community, as an active member of Boy Scout Troop 96 in Grayslake he earned the rank of Eagle Scout in 2011. As a Geospacial Engineer in the Army, he is responsible for using geographic data that supports military/civilian operations for Disaster Relief and Homeland Security. 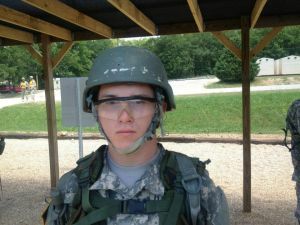 He has earned a sharp shooter medal during basic training. Downes’ package will be filled with beef jerky, chips, granola bars, and other treats with the help of this months sponsor, Consumers Credit Union. All heroes receive a “Hanging with the Heroes” care package delivered with a personalized “Hanging with the Heroes” t-shirt (donated by Artrageous of Hainesville), a piece of home and letters from Round Lake Area School District 116 students. Heroes also will receive a specially made rosary for the military from Legion of Mary from St. Joseph’s in Round Lake. The Round Lake Area Exchange Club will present a plaque to his family on Wednesday, October 23 at 7:30 a.m. at their meeting located at Panera Bread meeting room in Round Lake Beach.